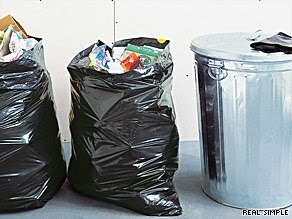 Is there a need for separate meat and dairy garbage cans? It's not as crazy as you might think. The Torah states three times that one may not cook milk and meat together. The Talmud (Chullin 115b) understands this to mean that there are three things that are forbidden: 1) cooking meat and milk together, 2) eating meat and milk that have been cooked together, and 3) deriving and form of benefit from a cooked mixture of milk and meat. If you cannot even cook milk and meat together, then pouring a hot dairy food into a garbage can that contains meat scraps would be forbidden cooking. Granted, it isn't too often that you throw hot food into the garbage. But it can happen -- say, if you overcooked some food and want to throw it out. The simple answer is not to throw out food that is particularly hot. I wouldn't do it anyway because I'd be concerned it would melt the plastic bag. If you are careful about that then you will be able to have a single garbage can for both dairy and meat. But there is another reason not to require separate garbage cans. The Kessef Mishneh (Hilkhos Tumas Meis 1:2) writes that the reason the Torah states the three prohibitions in the language of eating is to teach that only cooking which is a preparation for eating is forbidden. Other forms of cooking milk and meat, such as if they are cooked together in the process of throwing them out, are not encompassed in this prohibition. Others have pointed out that this can be inferred from the words of the Rambam (Hilkhos Ma'akhalos Assuros 9:2; cf. Glosses of R. Akiva Eiger, ad loc.). This ruling is affirmed by others, although some disagree. For example, R. Yosef Engel (Lekach Tov 8:3) considers cooking meat and milk to be a biblical safeguard, a prohibition intended to prevent eating such a mixture. R. Daniel Z. Feldman (Binah Ba-Sefarim, vol. 1 pp. 205-206) quotes other authorities who agree and disagree with this position. R. Ahron Soloveichik (cited in R. Hershel Schachter, Mi-Peninei Ha-Rav, pp. 195-196) told the following story about his father, R. Moshe Soloveichik. R. Moshe was asked by a student whether he can perform a chemical experiment that involves cooking dairy and meat together. He responded that the experiment is permissible, based on the above Kessef Mishneh, because the cooking is not a preparation for eating. If we follow this Kessef Mishneh in practice, then we do not need separate garbage cans for dairy and meat. Even if hot dairy and meat mix in the garbage and are incidentally cooked, this kind of cooking is permitted. As always, check with your rabbi on issues of practical halakhah.